This past weekend was our Canadian Thanksgiving. Thanksgiving is celebrated primarily in Canada and the United States, and traditionally is a day to give thanks for the blessing of the harvest. Our Thanksgiving is more low key than that of our neighbours to the south; in the United States, they have a huge parade, and the Friday after Thanksgiving, called Black Friday, is the official kick off to the Christmas Shopping Season. 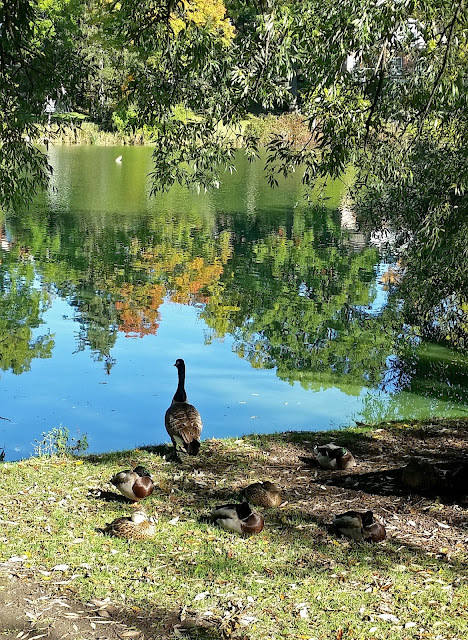 For me it meant a long weekend and as we were blessed with beautiful weather, on Saturday I took the train to Stratford, Ontario to visit my mother, who had recently moved to a senior's apartment residence there. I had been hit with pneumonia the week previous, and between drugs and rest, was feeling well enough to get out and enjoy what seemed like Indian Summer weather. When you don't have a car or a license, you rarely get a chance to enjoy what we used to call "a Sunday drive in the country", and I had missed being able to look out the window of moving vehicle at the autumn colours and the flat farmland surrounding the city where I live. 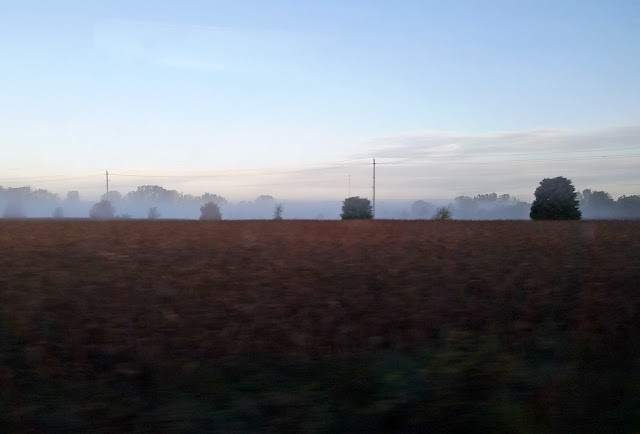 The train leaves London at the ungodly hour of 7:30 am, so I was able to catch the morning mist still on the fields before the sun burnt it off. Stratford is a city of approximately 31,000 people located on the banks of the Avon River. It was settled by Europeans who named it, and the river, after Stratford-upon-Avon in England. It has since become famous for being home to the world-renowned Stratford Shakespeare Festival. I used to take the bus from London to Stratford a couple of times each summer to see a play and visit the eclectic assortment of shops and restaurants there, but it had been at least 2 years since I'd been there. The first think I do when I arrive in Stratford is get some breakfast, so I found a little place in the downtown core to enjoy some bacon, eggs, and the thinnest home fries I've ever seen. It was like having potato chips with your eggs, which is not a bad thing. 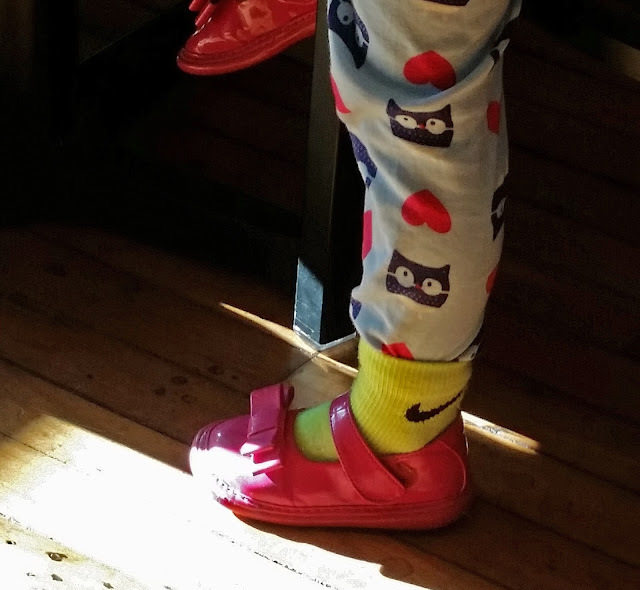 The cat-print pants and adorable girly shoes in the photo above belong to a likewise adorable little girl with blonde curls who was having breakfast with her dad. Even though I chose not to have any children of my own, I still enjoy watching well-behaved kids enjoying together time with their parents. In the summer and fall, Stratford is a hub of activity as tourists come to enjoy the theatre and the scenic beauty of the town itself. When I used to come and spend the day I would bring a book and sit by the bank of the river amidst the ducks, geese and swans who collected there. I had no book this time, but I still took a short stroll to the river to watch the ducks. The goose in the photo above seemed to be standing watch so the ducks behind him could snooze undisturbed. I felt like I could have sat there for hours, lulled into a stupor by the warm sun and mesmerized by the reflections on the water, but I had a limited amount of time before I was to meet my mother. One thing you must do when in Stratford is visit Rheo Thompson Candies, known for its melt-in-your mouth Mint Smoothies. The smell of mint chocolate wafts throughout the store and it is impossible to leave without a treat of some sort. It has become somewhat of a tradition that if someone in our office goes to Stratford, there is a hope they will bring a box of smoothies back for the rest of us, and I did not disappoint them. 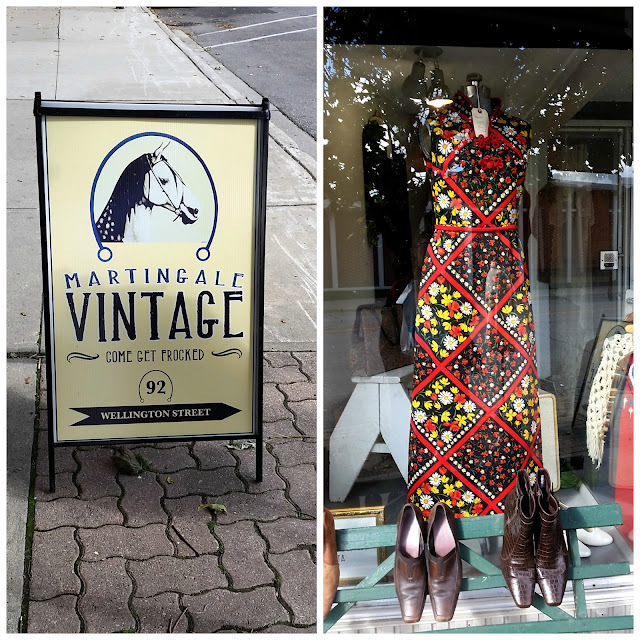 I had become aware of a vintage clothing store in Stratford called Martingale Vintage via Instagram, so I made a point of tracking it down while I was there. The owner, Kelly, was off for the weekend, so we didn't get to meet on this visit, but her employee Lara was very sweet. The pattern and colours of the maxi dress in the front window definitely drew the attention of people passing by. The shop is small but had a good selection of interesting vintage clothing. 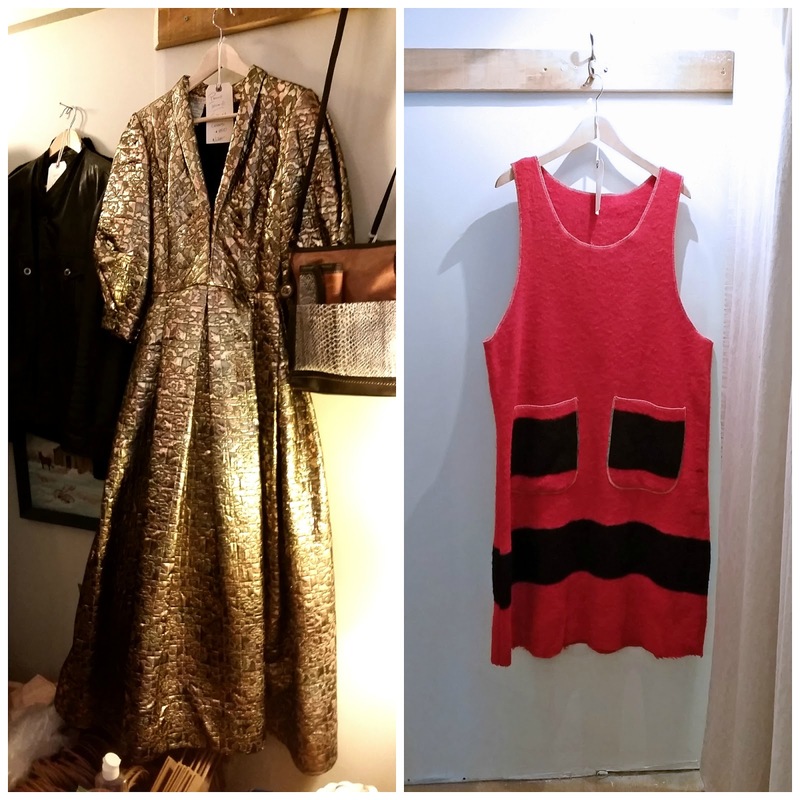 The dress on the right is a Hudson's Bay blanket dress, made by the same company who makes the iconic blankets. It was very heavy and would be extremely warm to wear over a sweater and thick tights. It ended up going home with Lara who had her eye on it for some time. 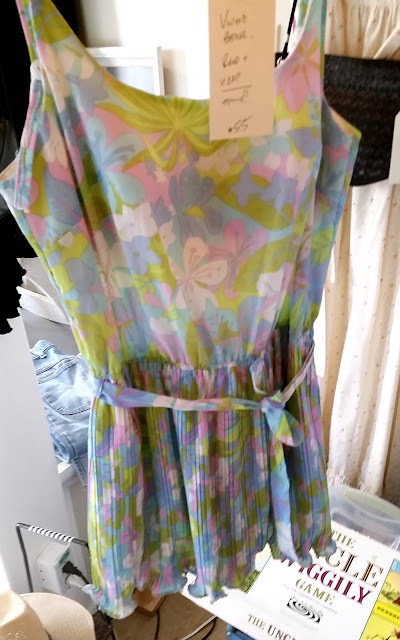 I have reached the age where I regard vintage bathing suits like the one above with a kinder eye, as I now understand the appeal of a skirt over the bottom of the suit, especially one with micro-pleats! My two favourite things in the store - on the left, a "some-would-call-Kitschy-I-would-call-awesome" three-dimensional bird and flower wall decoration. The flower petals appeared to be made out of plastic or shells, and I assume the bird's feathers were plastic as well. Sometimes you can't explain why you're drawn to something, you just are; it's like relationships with people. 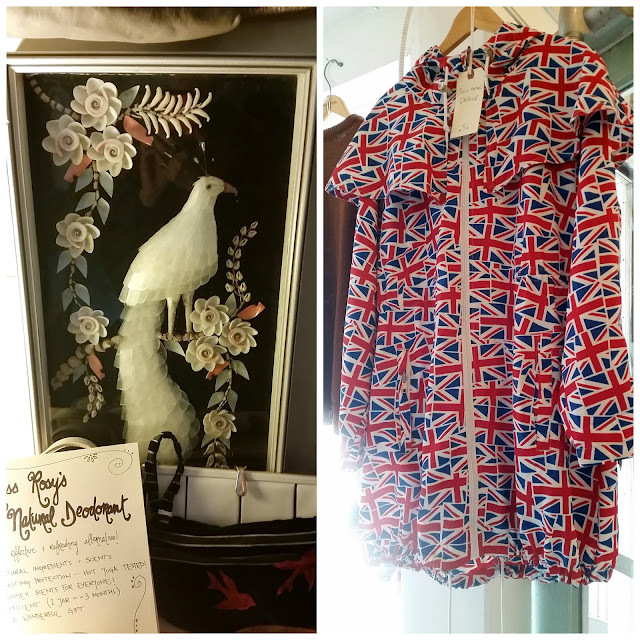 On the right, the other item that caught my eye - a lightweight coat with an all-over Union Jack print. I'm certainly no monarchist, but the combination of the red, white and blue and the little capelet really was irresistible. However, as I am getting ready for my annual pilgrimage to New York, I am trying not to spend money, so I left it in the shop. I did score a brushed cotton romper off the $5 rack which will likely appear in a blog post at some point. 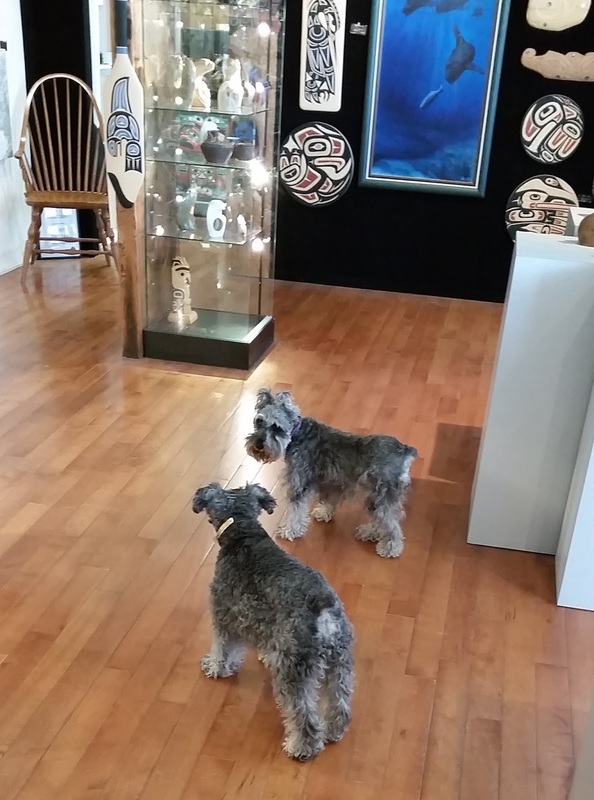 Later that day, my mother and two of our cousins went for lunch and afterwards stopped by Gallery Indigena, which specializes in Inuit sculptures and prints, Iroquois sculpture, paintings, and North West Coast masks. They also carry an assortment of gift items such as clothing, jewellery, scarves, posters and moccasins. While my mother and cousins were scoping out the jewellery, I was more interested in the store dogs, Keystone and Bella, who are very calm, well-behaved. They are Schnauzers, which shed very little and are therefore better for people with allergies, so I took full advantage of the opportunity to love them up without any unpleasant respiratory side effects. After several more hours of visiting, I caught the train back home. Now that my mother is living there, I will have an excuse to visit Stratford more often - I had forgotten how much I used to enjoy my day trips there. I hope you enjoyed your Thanksgiving weekend. I'm excited! 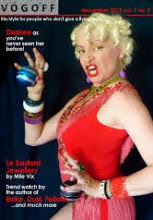 I have a new vintage shop to check out next time I'm there. Mind you, it probably won't be till next summer now. It is a long drive to Stratford from here and not fun to do it at night. You captured some of Stratford's highlights very well. You forgot it's claim to fame! LOL Justin Beiber! Ha ha. Well that and the Swan Parade. I've never seen it but I'd like to. That maxi in the window would have come home with me. I must follow them on FB or something. Glad to hear you're finally starting to feel a bit better. That looks so pretty - I love following along on your adventures! I had a schnauzer (named Schultz) when I was a kid. Sorry to hear you've had pneumonia! Yikes! Glad you are on the mend. Sorry to hear about the pneumonia. No wonder you wanted to just sit in the sun! 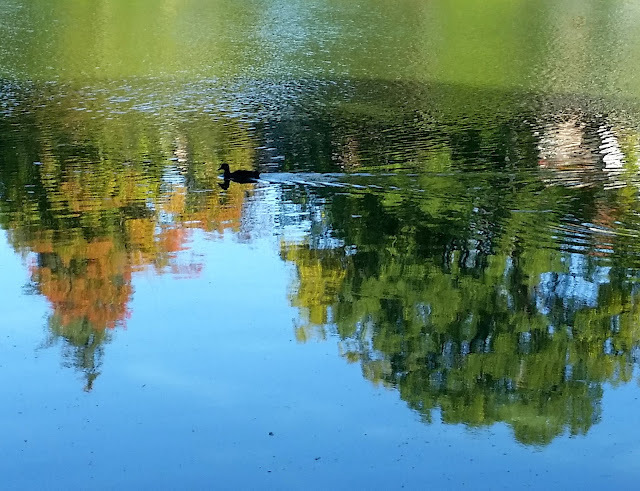 Love that duck and reflection pic. Sounds like a town to visit...if I was closer!!! Glad to hear you're feeling better, and that you had a good Thanksgiving.Your little bit of the New World sounds so interesting, but my favorite thing is that Union Jack coat! This post - the photos and your writing - really captured what that place feels like, or at least my memory of the place feels like. I always made a yearly trip to Stratford for the Shakespeare Festival. I used to swoon over the actors! I'm glad you had a good trip. All you have to do now is focus on getting totally rested for your next big adventure! Sorry to hear of your pneumonia, it really knocks you about, doesn't it? Hope you're feeling better. I live near to Stratford-Upon-Avon. Yours looks fabulous. I wonder if the Canadian version is full of American & Japanese tourists like ours is! The vintage shop looks great, love the dress in the window. The paper bird is a beauty. Glad to hear you are feeling better, and that you had a nice time in my neck of the woods! Martingale Vintage is such a lovely, tempting place. I also like Covet Consignment -- less vintagey on purpose, more general consignment, but she has some great pieces too. And it's always interesting to know something about local celebrations and holidays! besos & get well soon! Gorgeous photos of Stratford, Shelley. You have introduced me to a new city and I enjoyed the ride. Sounds like you had a wonderful Thanksgiving and visit with your mother. Hope that you are feeling better and on your way to NYC. 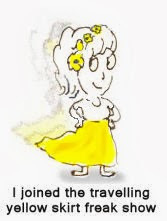 Eagerly awaiting the posts from your annual pilgrimage! I loved everything about this post. 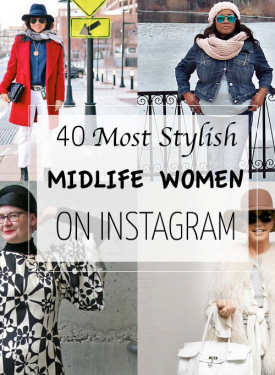 Especially the maxi and the bathing dress.